He Who appeared in the form of the Great Boar. "The Great varAha bhagavAn, Who has eyeslike full-blown lotuses and the complexion like that of blue lotus-petal, liftedthe Earth from the rasAtala (nether-world) by His tusk and emerged as a greatblue mountain". Similar description of the beauty of the eyesof varAha mUrti is found in tiruc-canda viruttam 45 - "perum kEzhalAr tanperum kaN malarp-puNDarIkam nam mEl oru'ngE pizhara vaittAr (SrI v.v. rAmAnujan).SrI cinmayAnanda comments that the varAha rUpa was taken to heave up the worldfrom the slush that formed naturally when the waters of the deluge receded. SrI satyadevo vAsishTha gives theinterpretation based on mahA + vara + Aha = He who bestows great blessings onothers. a) One who is praised by the gods (for Hishelp). b) One who dug out the Earth from the depths of the Ocean. c) The protector of cows. e) He who rescued the Earth. f) He who is known by vedic sentences. g) He who is responsible for all things that move. This nAma occurred earlier as nAma 189. Pleasesee the detailed explanation in Slokam 20 also. Explanations a) to d) were givenunder Slokam 20. SrI BhaTTar gives interpretation e - avariation of explanation b - under the current nAma viz. bhagavAn is govindahbecause He rescued the Earth from the rAkshasa. SrI Sa'nkara gives the interpretation f) underthe current nAma: "gobhih - vANibhih vindate" - He Who is known (vid)through words i.e., vedic sentences. SrI Sa'nkara gives the reference fromvishNutilaka - gobhireva yato vedyo govindah samudAhRtah - "You are namedgovinda as You are to be known through scriptual texts". SrI satyadevo vAsishTha derives hisinterpretation starting from the root gam - gatau - to go (gacchati iti gauh),and gives the meaning "to possess" to the word vid (vid - lAbhe - toget), and thus derives the interpretation g above. His explanation is thatanything that moves, including our mind, our indriya-s, the Sun, etc., are Hispossession, and so He is called govindah. He gives this interpretation for thenAma "govidAm patih" also. He supports his interpretation based on"gacchati iti jagat" - BhagavAn is present everywhere as seen by themovement of everything in this world. The life in all things that live isassociated with movement, and He is the One who is behind this movement -govindah. a) He who is equipped with a body with Suddhasattva Sakti-s that are like an army. b) He Who has an army of auspicious associates. a) SrI v.n. vedAntadeSikan comments that fromthis nAma onwards, certain abstruse or rather esoteric meanings are implied,which are only to be learned through the AcArya-s, and are not communicated inprint. Thus the explanations found in print are cryptic. SrI v.v. rAmAnujan addsthat the current nAma and the following few nAma-s are in the category of whatsage viSvAmitra refers to when he says "aham vedmi" etc. to daSarathawhen he persuades daSaratha to send rAma with him. He reassures daSaratha thathe, and not daSaratha, can understand the greatness of young rAma because he isa king of Rshi-s, whereas daSaratha is only a king of men. susheNah is interpreted as su-senah (One whohas a good army) by SrI BhaTTar. He explains that bhagavAn has a body which ispure suddha-sattva, and the constituents of this suddha sattva body are like anarmy that can win over the baddha-s, mukta-s and nitya-s and make them join Himin mutual enjoyment of Bliss. The constituents of bhagavAn's body are the pa'ncamahA Sakti-s, parameshThi, pumAn, viSvah, nivRttah, and sarvah, just as ourhuman body is constituted of the pa'nca bhUta-s. The pa'nca mahA Sakti-s are allsuddha sattva dravya-s, and they can be realized and understood properly onlythrough the upanishads. Therefore they are also referred to as the pa'ncaupanishad mayam. These pa'nca mahA Sakti-s or the pa'nca-mahopanishad-mayadravya-s constitute the senA referred to in this nAma. SrI P. B. aNNa`ngarAcArya svAmi summarizes theabove as indicating that bhagavAn has the multitude of means that are useful inhaving His devotees under His sway. nammAzhvAr refers to bhagavAn's guNa-s beingHis Strength or army in the following reference given by SrI v.v. rAmAnujan -"mazhu'ngAda j~nAnamE paDaiyAga" - (tiruvAimozhi 3.1.9). b) SrI Sa'nkara gives the interpretation thatbhagavAn is susheNah because He has a distinguished army at His command. SrIrAdhAkRshNa SAstri elaborates that this includes the following 9 gaNa-s: 12Aditya-s, 10 viSvedeva-s, the ashTha vasu-s, 26 tushita-s, 64 AbhAsvara-s, 49marut-s, 30 mahArAjika-s, 12 sAdhya-s, and 11 rudra-s.
SrI satyadevo vAsishTha derives the nAma fromthe root si - bandhane - to bind. He gives the interpretation that bhagavAn isOne who binds everything well (His devotees to Him, His army of deva-s, sages,etc. together well, He Who holds all the beings of the world together well, HeWho binds all the constellations together well, holds this frail body of ourstogether well even after the jIva departs from the body, etc. He givesreferences to the Sruti for this nAma in yajurveda - ayamuparvAg-vasus-tasyasenajiica susheNaSca (yajur. 15.19), satyajicca senajicca susheNaSca (yajur.17.83). He Who is adorned by armlets of gold. kanaka literally means gold, but here is notto be taken literally as the material gold that we are used to. The term"gold" used in the current context just refers to the superiority ofHis bhUshNa-s. SrI v.v. rAmAnujan points out that in antarAditya, bhagavAn isdescribed as resembling gold in appearance - antarAditye hiraNmayah purushahdRSyate. nammAzhvAr calls bhagavAn by the names "mANikkamE! en marakatame!maRRoppAraiyillA Anip ponnE!" in tiruviruttam 85. 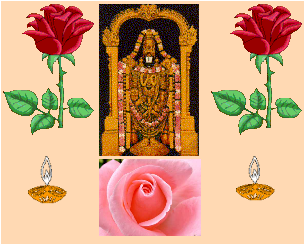 What is referred to hereis the extraordinary brilliance of His appearance and the extreme attractivenessof His tirumeni. Thus, the reference in this nAma to kanaka isto the non-material, suddha-sattva. The ornaments referred to here are not theones composed of the material of this world and made of up of the three guNa-s -sattva, rajas, and tamas, but are ones composed of celestial matter (Suddhasattva), which set off the beauty of His celestial body described earlier. a`ngadam means armlet. Again, the reference isnot only to the armlet, but all the tiru AbharaNa-s of bhagavAn. The armlets areone example of these ornaments that adorn His body. SrI rAdhAkRshNa SAstriobserves that the armlets, kirITam, keyUram, etc., are the ornaments of vIra-s.
SrI BhaTTar points out that the ending ini inthis nAma refers to the constant and permanent association of the brilliancereferred to in this nAma with His tirumeni (nityayoge inih). SrI satyadevo vAsishTha interprets the nAma interms kanaka, a`nga, and da, meaning The Giver (dah) of brightness (kanaka) toeverything and the One who keeps things moving (a`nga from a`ng - to go). Theassociation or connection between the kanaka and a`nga aspects can be seen bynoting that as long as the body keeps moving, it has the brightness in the eyes,and the brightness ceases when the body ceases to move. SrI BhaTTar points out that He is concealed bythe possession of a body which is made of the celestial matter (Suddha sattva),which fact is revealed by the great upanishads. Thus His divya Atma-svarUpacannot be comprehended by us. nammAzhvAr declares: j~nAlam uNDu umizhnda mAlaieNNumARu aRiya mATTEn (tiruvAimozhi 3.4.9) - "I can't comprehend thisemperumAn who swallowed the whole world and then recreated it". SrISa'nkara gives two interpretations: 1. rahasya upanishad vedyatvAt - One who isto be known only by the esoteric knowledge conveyed by the upanishad-s; and 2.guhAyAm hRadayAkASe nihita iti vA, guhyah - He who is hidden in the guha or theheart. SrI rAdhAkRshNa SAstri elaborates on this further and points out that theidea here is that He is not realized through the ordinary senses or thereasoning by the mind, but only by deep inward meditation and contemplation. Hecannot be revealed by someone else to us, but only by our own inward search.Thus He is guhya or concealed. He who is deep or mysterious. He is gabhIrah because of His gAmbhIrya - HisMajesty which is deep and cannot be completely comprehended. BhagavAn is calleddeep because His Nature is not easily understandable; His majesty can only beapproximately conceived. If the bound souls which are tainted by deepbeginningless Nescience can become pure by merely coming into contact with Him,this can give an approximate idea of His greatness. This is like the muddy waterwhich becomes clean by coming in contact with the kataka seed. SrI rAdhAkRshNa SAstri adds that BhagavAn ismysterious because He has the simultaneous co-existence in perfection of all thesix guNa-s - j~nAna, bala, aiSvarya, vIrya, Sakti, and tejas. Just as the bottomof a very deep lake with very clear water looks like it is very near in spite ofits depth, BhagavAn's depth is impossible to find even though it appears that Hecan be easily comprehended. He is very far though He appears to be very near forthe ordinary beings. a) He who is deep, Impenetrable, Inexplicable. gahanam refers to a forest, a fortress etc. Wecannot see or figure out what is inside a dense forest or in a well-builtfortress. BhagavAn's Nature is similar (SrI rAdhAkRshNa SAstri). In hiscommentary on amarakOSam, appayArya gives the explanation "gahanamdushpraveSa sthAnam" - A place which is difficult to access. SrI BhaTTarexplains the nAma as dur-avagAhah, and SrI Sa'nkara gives the description "dushpraveSatvAtgahanah", both of which convey the above idea. Even though we can see thebottom of the Ocean when the water is clear, it is very difficult to access thebottom of the Ocean floor. So also, even though bhagavAn may seem easy torealize because of what is revealed in the upanishad-s, all the same it isdifficult to grasp His Nature. The Sruti declares Him as "aprApya manasAsaha - Inaccessible to the mind" (SrI v.v. rAmAnujan). b) The alternate interpretation for gahanah isbased on its derivation from the root gAhU - viloDane - to dive into. BhagavAnis called gahanah because He is inside everyone and everything, and is thewitness of everything in its waking, dream and sleep states (SrI Sa'nkara).Through these three states we get an understanding of what is within our abilityto comprehend. But through these three states, we cannot get an idea of One whois the Witness of these three states in all of us (SrI rAdhAkRshNa SAstri). This nAma is formed from the root gup -rakshaNe to protect, to conceal. SrI BhaTTar explains that BhagavAn's Greatnessis guarded and protected well by the pUrvAcArya-s who knew His Greatness by HisGrace. One cannot hope to learn of the Lord's mahimA except by being guided bythese AcArya-s of our sampradAyam. Even the upanishads cannot completely revealBhagavAn to us. He is known only to the likes viSvAmitra who declares "ahamvedmi mahAtmAnam - I know the greatness of young rAma". It is only byfollowing the sampradAyam of the AcArya-s and following their instructions withsincerity that one can realize Him who is hidden to us otherwise. He is also One who is protected with greatcare by the likes of anantAzhvAn, garuDa, vishvaksena, etc. Even in paramapadamwhere it is not easy for anyone to go, He is protected by ananta who is spittingpoisonous fire - "a'ngu AravAram adu kETTu azhal umizhum pU'ngAraravaNaiyAn pon mEni" - (nAnmugan tiru antAdi 10) - SrI v.v. rAmAnujan. SrI Sa'nkara explains that BhagavAn is hiddenbecause He is not accessible through words, thought etc. - va'ng manasaagocararvAt guptah. Even though He is in every being, He is not manifested -esha sarveshu bhUteshu gUDhah AtmA na prakASate - kaTha upanishad 3.12. We alsohave "yato vAco nivartante aprApya manasA saha" - brah. valli 4 oftaitt. upa. The bearer of the discus and the mace. This nAma of bhagavAn is referenced in yuddhakANDam 114 - tamasah paramo dhAtA Sa'nkha cakra gadA dharah. SrI nammAzhvArrefers to Him as "nAngu tOLan, kuni Sar'ngan, oN Sa'ngu gadai vAL AzhiyAn"(tiruvAimozhi 8.8.1) - SrI v.v. rAmAnujan. While the superficial reference inthis nAma is that BhagavAn is the bearer of cakra, gadhA, etc., SrI M. V.rAmAnujAcArya explains that the reference to the pa'nca mahAyudha-s (Sankha,cakra, gadA, Sar'nga, and nandaka) has deeper signifcance. These are also theincarnations or personifications of the pa'nca Sakti-s viz. sRshTi, sthiti,samhAra, nigraha, and anugraha. These pa'nca mahAyudha-s are an integral part ofbhagavAn's SarIram which is of Suddha-sattva made of these five mahA Sakti-s,and are like His instruments in His five functions of creation, protection,destruction, giving punishment, and giving benefits. The pa'nca mahA Sakti-shave been referred to earlier (in nAma 544). SrI v.v. rAmAnujan adds that inaddition, the pa'nca Ayudha-s are also none other than the nitya sUri-s e.g.,sudarSana AzhvAn, pA'ncajanya AzhvAn, etc. Note that the five paramAtma Sakti-sare here associated with the five functions (sRshTi, sthiti etc. ), the fiveAyudha-s of bhagavAn, the nitya sUri-s, etc. in a simple way and clearly. SrI rAdhAkRshNa SAstri quotes passages from SrI vishNupurANam (1.22.69-74) to identify the five Ayudha-s as representations of thedifferent tattva-s: BhagavAn supports egotism (rAjasa ahamkAram and mAnasaahamkAram, into the five elements and the five organs of sense), in the emblemsof His conch-shell and His bow; In the form of His discus, He supports the mind(manas), whose thoughts, like the weapon, fly swifter than the winds; The brightsword of vishNu is the holy wisdom (vidyA); Intellect (buddhi) abides in mAdhavain the form of the mace (gadA). This nAma refers to His form where He holds themanas tattva and the buddhi tattva in His two hands in the forms of the cakraand gadA respectively. The broader meaning of the whole passage in SrI vishNupurANam is that BhagavAn is the source and repository of everything there is -soul, nature, intellect, egotism, the elements, the senses, mind, ignorance, andwisdom. All that is wisdom, all that is ignorance, all that is, all that is not,all that is everlasting, is centered in Him. He is time, He is earth, He is sky,He is heaven, etc. Those interested should read the section of SrI vishNu purANafor a continuation of this beautiful description of His "viSva rUpa".Thus the nAma also signifies that bhagavAn is the source and controller ofeverything there is, was and will be.